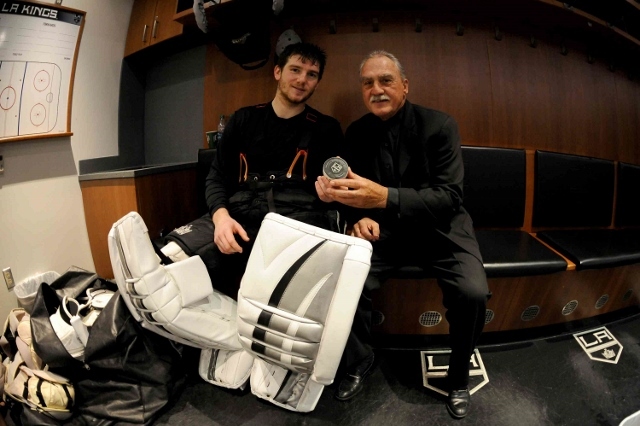 Jonathan Quick won the 172nd game of his career on Saturday, surpassing Rogie Vachon as the winningest goaltender in Los Angeles Kings history. For Quick, the 172 wins came over a span of 327 games played. For Vachon, the 172 wins came over 389 total games, a remarkable accomplishment given that games ended in ties after 60 minutes and the possibility of earning wins in a shootout represented a farfetched science fiction story. The Kings also varied in their level of distinction in the 1970’s, posting only one 40-win season. 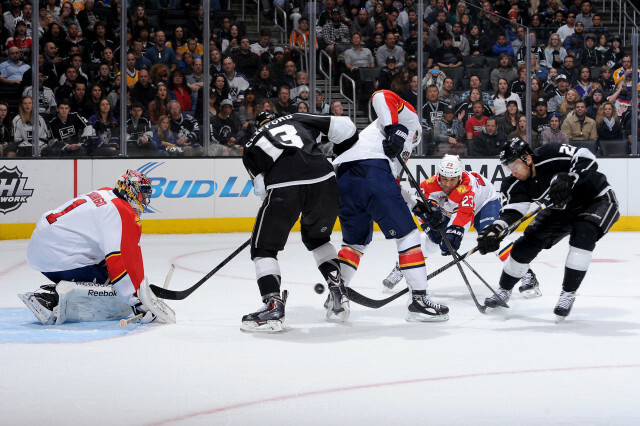 The 2013-14 Kings team won its 40th game of the season against the Panthers, a mark that has been reached four times in the last five seasons. 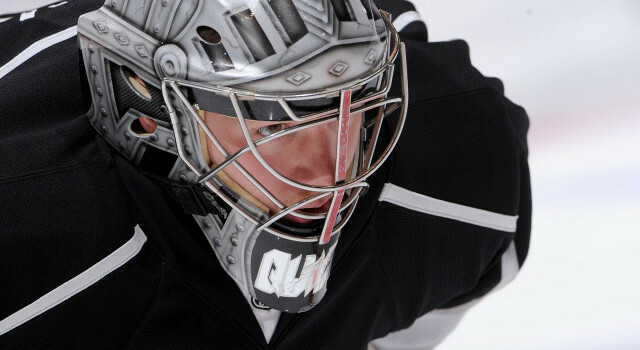 Los Angeles was on pace for 46 wins in the lockout-shortened season of 2012-13. By posting his 30th career shutout on Saturday, Quick also closed to within two shutouts of Vachon’s club record of 32. 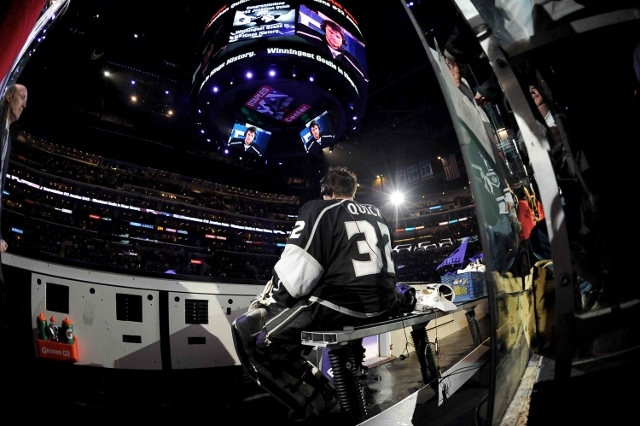 To read more about Vachon talking about the Kings teams he played for, and what he sees in Jonathan Quick, I recommend my LAKings.com story from two weeks ago: Rogie and Quick. 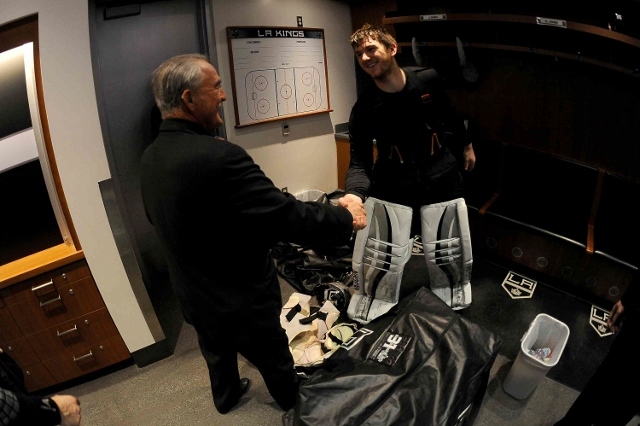 For more on a banner day in the history of Kings goaltending, and to learn more about the relationship between Quick and Vachon, here are the quotes and photographs from the team’s locker room after the game. It’s wonderful. Unfortunately, I only played like six-and-a-half years here, but you know him. He’s going to play maybe 15 to 20 years the way he’s doing. 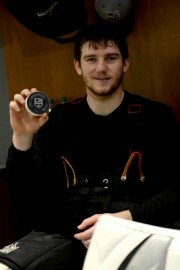 So he’s going to set some records that I think no other goalie in the league coming later will ever touch. Obviously it’s very special. We’ve done a few things before in the past, interviews and he’s ben to many games. It’s great to have him around from time to time and see him and he talks about some old stories. The support means a lot. But I think the biggest thing is obviously, like I said earlier, when you talk about wins it the 20 guys it takes to win a game. The goalie is always kind of nominated to receive most of the celebration as far as wins and shutouts, but it’s a group effort and it means a lot that I’m able to celebrate it with the guys in the locker room too. His ability to move from one side to the other is just absolutely phenomenal. I’d never seen that before. The save that he made today in the second period coming from one side and going onto the other side to grab it, very rarely do you see that in the league even now. I’m just taking it one game at a time. [Vachon: He’s just a puppy. He’s got plenty of time.] Hopefully, I’m fortunate to have that kind of health and luck to be able to play that long. But for now, we’re just taking it one game at a time. It was a blowout. I think we beat Buffalo like 8-2. I didn’t see too much work, either. It was a good first game to get in there and get your feet wet and I had a lot of support. [Reporter: You’re family couldn’t make the game because they didn’t have enough notice, so you’re dad bought the NHL package to see the game.] Yeah, that was seven years ago. I had been called up because of an injury and I think it might have been J.S. Aubin who was the guy that was healthy. So he played a couple in a row and they gave me the second and didn’t tell me until the morning of. So my parents would be coming from Connecticut, so they weren’t able to get out in time obviously but it’s still special to be able to get the win in your first professional game. Please don’t ask me about my first win. I have no clue. It’s been like 50 years. I was wearing a mask then, a small one. 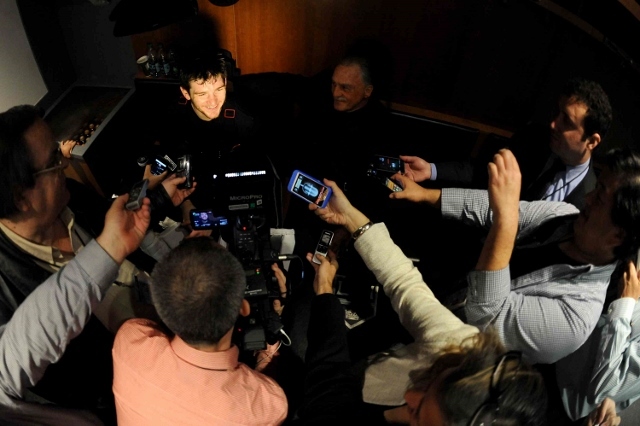 [Reporter: You stopped someone a breakaway your first game.] My first game ever… I stopped Gordie Howe on the breakaway. It kept me in the league for 15 years. He doesn’t even know who Gordie Howe is. I see clips, not full games. I see clips, highlights. There are a lot of them, so I’ve seen those. [Reporter: What did you think when you saw those clips?] Tremendously the game has changed. I think it is a big emphasis on team defense. Before, it used to be the goalie had to make the saves and then five guys might try to score. They rely on a lot more than the goalies nowadays. You’re more of a six-man unit in your own end, so you’re all working together. Obviously, like Luc was saying earlier, not the biggest guy but he’s able to find the pucks and compete for saves. It creeps in your mind a little bit. It’s a situation where you’re caught up in the moment. 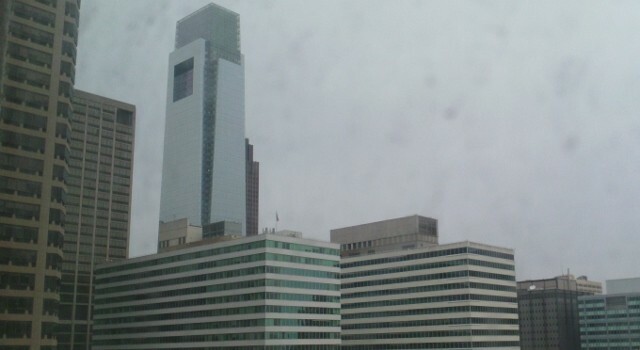 We fly to Philly this afternoon. We play a game in two days, so your focus moves on pretty quickly to that next game. Especially, now this time of year where everyone is try to jump positions, the playoff push, things like that. It’s a short-lived enjoyment because you have to get ready for the next game in a hurry. Yes, without a doubt. Even in the summertime where you have some time to kind of decompress and look back on the year and really get a full understanding of what you’re able to be a part of with the guys. My parents have a lot of stuff and I have a lot of stuff. Just over the years, being able to play on different teams, we’ve been very fortunate up to this point in my career. You get a couple little things you hold onto and you put in the attic and you get to show your grandkids when you’re a little older. I think we flew out, not right after, but the next morning we were out of here and we went to like Dallas or Chicago or somewhere. So it’s kind of the same thing. Obviously, you’re a lot younger then, so you’re hoping that maybe you get another start and what can you do to try and prove yourself. So it’s the same thing. You’re caught up in the moment. You’re caught up in the ups and downs of the season and you try to stay on track.